You’ve worked hard on your managed travel program. You’ve implemented a corporate booking tool (hopefully Deem Work Fource!). You’ve negotiated hotel and airfare rates. You’ve set your industry standard per diems. Now it’s time to look at the less obvious areas where you can find savings and efficiencies for your travel program. Your online booking tool gives you access to varying levels of functionality. If you implement an enterprise level tool (Deem, Concur or GetThere) vs a light weight tool (such as TripActions, Lola or TravelPerk) you’ll have a number of options and customizations available to turn on. For example, some of the cost saving features in Deem need to be activated before they “turn on” inside the platform. Automated ticket exchange (which automatically applies unused tickets to airfare purchases without the help of a travel agent) can save you hundreds of thousands of dollars a year. Ground transportation content gives your travelers access to varied options that may be easier (and cheaper) than relying on Uber or Lyft. Branded fares give you access to flight fares you won’t find in other platforms. There are many other areas you can customize your platform and it’s well worth the time it takes to optimize your OBT. How do I get started, you may ask?You may have access to these configurations inside your admin profile or you may need to contact your booking tool account executive. At Deem, our support team is always ready to help you make the most of your corporate travel booking platform. It’s a common refrain: corporate travel is stuck in the dark ages. But not always. At Deem (and other companies) you’ll find teams working on interesting innovations, from chatbots and messaging platforms to personalized content and machine learning apps. Many of these technologies are unproven but the upside is huge. At the very least, the potential for making life easier for your travelers will help you grow adoption and compliance. Sign up with your partners for their (often times free) pilot programs and reap the rewards for your travelers. 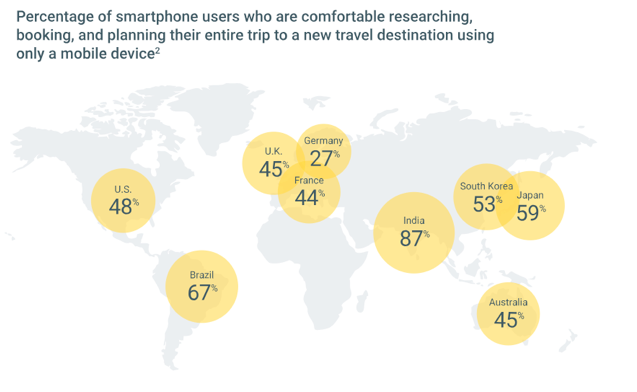 According to a Google and Phocuswright study an increasing number of the world’s travelers are comfortable using mobile devices to manage their trips. That means, if you want to keep your travelers happy and maintain compliance, you’ll need a fully functional mobile app or responsive website that works well on smartphones. If your travel management company app doesn’t provide the functionality you want (such as searching, booking and managing all the trip components), you can ask your online booking tool provider (preferably Deem!) for the necessary functionality. There are many more steps you can take to improve your travel program, but these three will get you started on the road to happy travelers and a cost saving travel program.